Liz's Paper Loft: MCT August Release Sneak Peek Day 3 ~ eek! Well we are half way through My Creative Time August Release Sneak Peeks, yep so today is day 3! I really hope you've enjoyed the week so far! I'm not sure if I'm suppose to tell you this, some of the stamps used for my card is part of the "freebie" set (details will follow on Friday)! How cool is that! So to create this card, I first used a grey Distress Paint with a linen stamp. Once it was dry, a watercolored the background, and again let dry. Then I ink blended to create more depth. Lastly I stamped the witch. 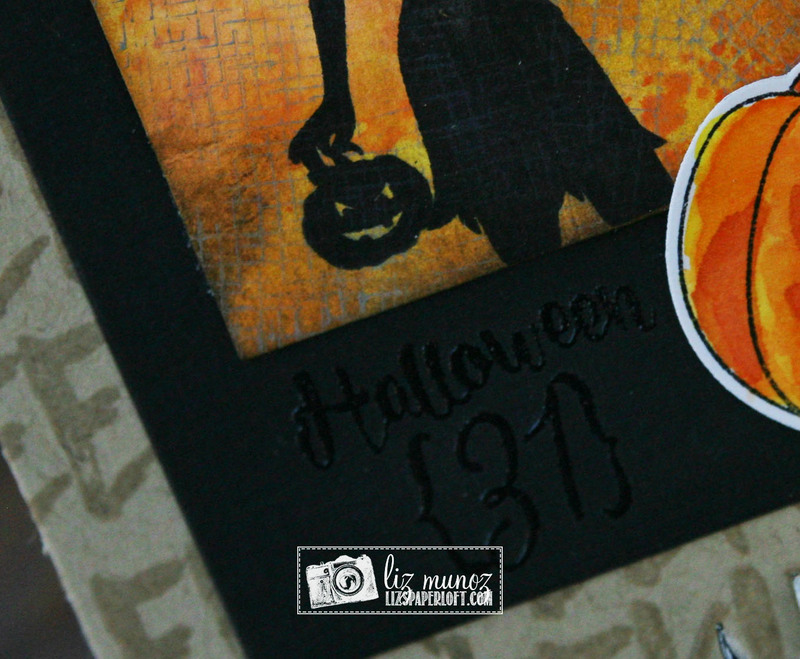 On the black cardstock I heat embossed the "halloween 31" in what I thought was Ultra Fine White, however it must of been clear. I was really disappointed at first, but then I realized that I liked the tone on tone look. So win win! I used VersaMark ink for the "eek" words for more tone on tone look. Liz this is a beautiful card! 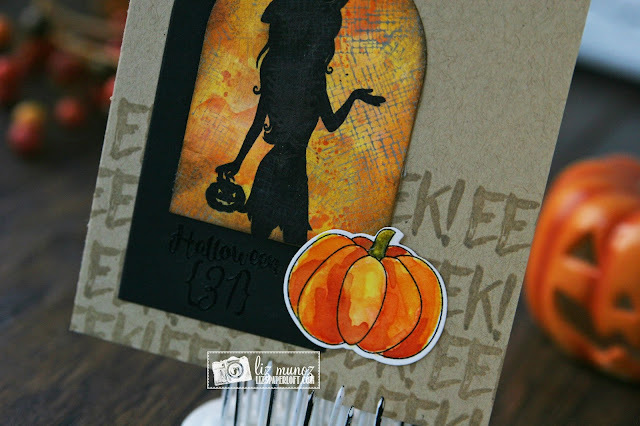 I love the kraft... and that orangey paper... that pumpkin really pops and together this card look amazing! Thanks for sharing! OMG Miss Liz Your card is Wicked Awesomely Gorgeous...WOW I'm in awe of what you created and how you achieved your look. Oh it definitely turned out Perfect. Great Stamping job. Love how you used all of Miss Emma's goodies. Your Card is Spooktacular!! YOU so ROCK!! Awesome card!! Love the look! What a gorgeous card Liz!!!!! Ms. Liz, love your card, so much detail and thank you so much. Always beautiful results. I love Halloween and I am a witch every year! Greatwork! Thanks for the inspiration! Wow, that background for the witch is just awesome!!! Love this card!!! WOW!! I always look forward to your cards ... and they never disappoint! Your creativity and attention to detail is amazing. Thank you for sharing. You are always an inspiration!! Love your creativity!! You did a fab job! The black really gives depth to the scene. She looks like she's inside a building. Super FUN design! I love the embossing on the craft paper and the water coloring turned out fabulous! The silhouette really pops! I love the tag die arch and that background that glows! Beautiful frame for the pretty lady! Wonderful job. 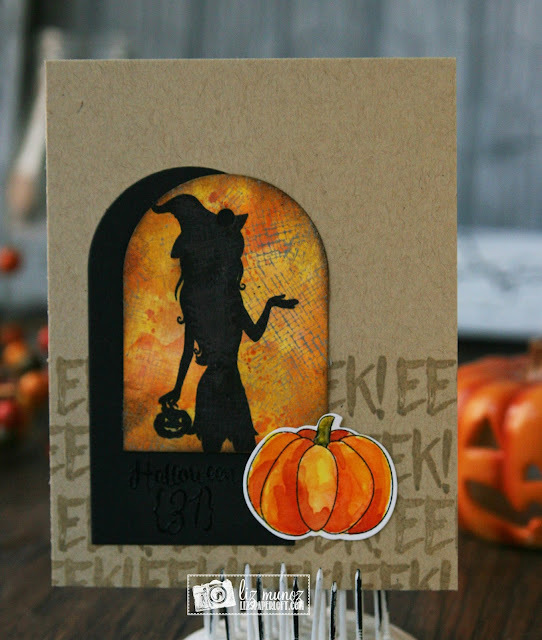 Great job love your card the witch silhouette is awesome.. love the Halloween 31st in bossed..
Love this card and especially the black inset! Your card is amazing!!! Love the "window" and the subtle way you created the EEK in the background!!! Very nice! Awesome window you created for the witch silhouette, and I love the background and pumpkin! Great details on this fabulous card! Really love the design of your card! It looks amazing! LOVE the background and the way you coloured it.